I have a true passion for teaching, and it is my strong belief that the humanities are indispensable in providing undergraduates important tools to understand the world and to actively engage in society. Like my scholarly activity, my approach to pedagogy is broad and interdisciplinary. 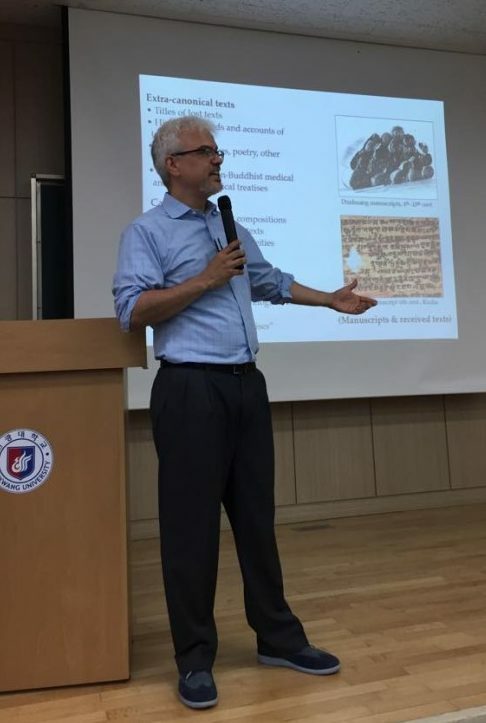 I regularly teach introductory survey courses on East Asian history, Asian Religions, Buddhism, and the Silk Roads, as well as a range of upper-level undergraduate courses in topics related to the history of Asian religion and medicine. I also advise students in independent research on Buddhism and health through the Abington College Undergraduate Research Activities program. Read more about my teaching philosophy. In 2011, I received a Teaching Innovation Fellowship from Abington College for development of an iPad-enabled hybrid history of medicine course that utilized the public history resources in the Philadelphia area. In 2014, I also received a grant from PSU’s Schreyer Institute for Teaching Excellence for the development of an interdisciplinary team-taught course on visualization that put Buddhist meditation at the center of a STEAM project. This course went on to become a New Media Consortium 2015 Idea Lab Winner. Blog about my “scorecard” method for maximizing success in a diverse classroom. Blog about my “Dynasties & Dragons” role-playing game for developing term papers. I offer individual or group instruction in Traditional Thai Medicine, Buddhist Medicine, and classical Chinese medical texts, geared toward practitioners of complementary alternative medicine. In the past, I have given seminars and lectures for practitioners at Pacific College of Oriental Medicine, Won Institute of Graduate Studies, and a number of alternative medicine schools in the U.S., Canada, and Germany. Please email me to talk about setting up a class, or follow me on Facebook to hear about upcoming events.